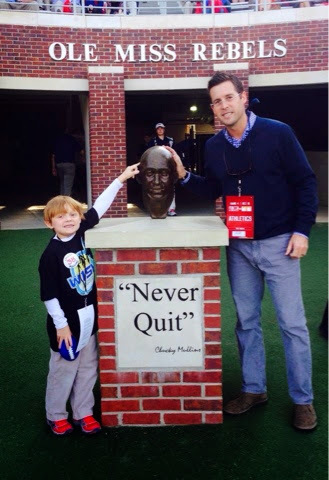 Well the rest of October wasn't as exciting as the rest of the month with Ingram's birthday, SJ day, and Tebow weekend; but, he here are some pictures to show what he's been up to these past two weeks! Ingram is still "training" for the "marathon" as he calls it. He's made it for a mile with the girls and with Daddy too and can even run with lots of booboo's! This one was when it was right after they got back from their weekend in Oxford and Ingram still had lots of energy...enough to sprint at the end and tease Daddy because he beat him! "Ha Ha! You Can't Catch Me!" Boo Boo's Are For Babies! This day was pretty fun for the kids! Madison got inducted in to The National Junior Beat Club at school and we let the little two tag-along and watch it before going to their schools late. They seemed to be so proud of Madison for a moment and then turned back to the wild and crazy kids we know they are. I'm not sure the middle school is ready for two Dismuke kids to be there at once next year! Awe...Look At Those Sweet Loving Siblings! Wait...Where Did Those Sweet Loving Kids Go?? From Beta Club At The Middle School To Pumpkin Party In Kindergarten! Can You Tell He's Ready To Get Up And Play?? No Matter What's Set Up For The Kids To Do, This Is All They Need...Outdoor Space For Tag! One of the things Ingram loves about school is that he gets random days out of school when the girls still have to go to school. After they were gone, he finally woke up and decided he wanted to play outside in his pajamas so that is just what we did! Around The Girls And Daddy Too Long Talking About Rolling People! We had a pretty fun weekend, but the only down side was that we were separated again for part of it. 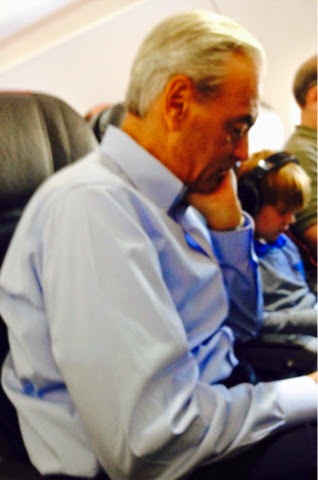 The boys headed off to Dallas to speak at a St. Jude event while the girls stayed home for a soccer tournament. We managed to squeak in a little birthday happiness between soccer games and before Daddy and Ingram left for the airport that morning. We had a great time on the soccer fields and at the movies while the boys had a fun time in Dallas; Madison was sure to tell Daddy to stay away from Ebola at least 100 times before they left! Even Beau Squeezed In The Birthday Picture! Ingram Was So Excited To Use His Brand New "W15H" Suitcase And Even Helped Pack Himself! Hopefully There's Decent Clothes In It And Not Just Toys! Ingram Doing What He Does..Playing Games When He's Not Entertaining The Plane! This Is The Only Picture Craig Took At The Event And It's A Pretty Typical One For Ingram! He Loves To Go Around And Pick Things Up After The Program No Matter What It Is. Tonight, It's Cloth Napkins...Dirty, Already Used Cloth Napkins! Walking Through The Dallas Airport With None Other Than Mr. And Mrs. Shadyac! Thing It's A Fairly Short Flight! Another thing the girls have taught Ingram is how to "Boo" people. Normally during the month of October, we pack up a bag of treats and candy and leave it on someone's door at night without them knowing. It started out very innocent with things like pencils and bouncy balls and candy, but has not turned into all of that plus the addition of silly spray. However, the silly spray isn't in the bucket at the door, it's behind people hiding so that when you open the door, you get sprayed. 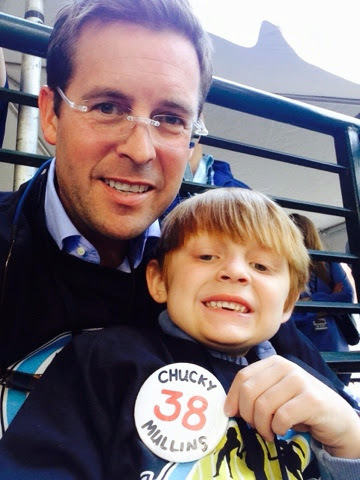 This has become a tradition with a few families and Ingram loves to get in on it too. This year, he wanted to "boo" two of his friends Grey and Daniel, but neither of them were home that night. Since he had packed the bags all by himself and the girls were gone, he insisted that we go ahead and do it, so we did...minus the silly spray which we will save for another day! Ingram Running Back To The Car After His Special Delivery! "Oh Yeah, I Did It All By Myself!" Another fun this about Kindergarten is being Star Of The Week! This week is a special and Ingram has a Show and Tell every day, made a poster (with Lindsey's help), and even had special visitors in the classroom! He did ask if every week could be Ingram week, so we might need to work a little more on that! 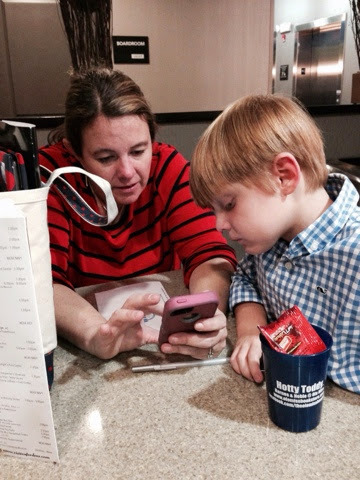 Ingram And Mimi Who Just Happened To Be In Town During Ingram's Special Week! Mimi Reading To The Class After She Had Lunch With Ingram! The Always Necessary Funny Picture! Ingram's New Show And Tell From His Trip! "Show And Tell" Should Really Be "Punch And Tell" In This Case! Ingram's 5th Grade Friends Collin And Calvin Came Down To Read In His Class Too! And No, Today Was Not Supposed To Be A Matching Day! 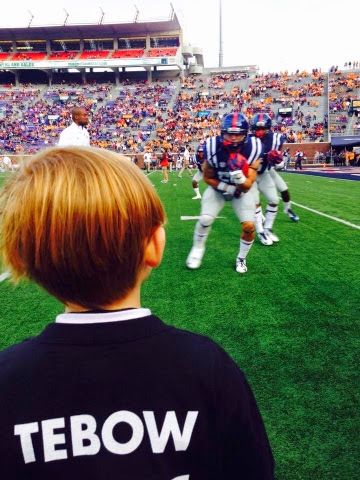 Alrighty, now it's finally Halloween and Ingram is soooo excited about Trick Or Treating in his new Ole Miss Football uniform! Madison is the Cancer Conquering Fairy complete with a matching green tutu and Elites while Lindsey is a Frankenstein Mad Scientist lingering around from Crazy Chemist Day at school! Could we all just go ahead and agree that the candy should only be around for about a week and move on?? If not, we might just go crazy here at the Dismuke house with all the extra sugar on top of our already energetic kids!!! But then again, we do love to eat candy!! Madison has soccer practice and she's supposed to dress up in her uniform...a Cancer Conquering Fairy! She also said that her King (Daddy in case you were wondering) needed to carry her since she got hurt! And Ingram said his traditional "Whattttttttt????????" followed by "Take a picture Mom!" "Look Mom! 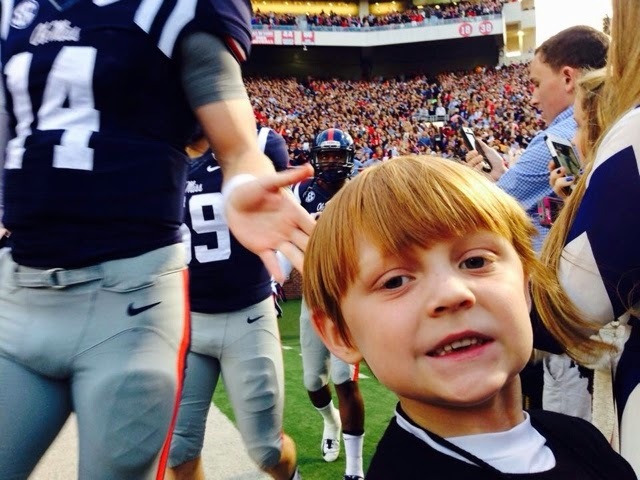 I'm A Ole Miss Football Player With A Rocket And Spider On My Cheek. Awe Man, No One Can See It Once My Helmet Is On!" The Trick Or Treating Gang At The West's House! "Mom, You Do No Need To Take A Picture. We Have To Go!" Yes, That Was Ingram...He Wanted To Catch Up With The Big Kids! Two very big events are coming up next and we can't wait to tell you all about them! November is Ingram's Homerun Derby and Birthday Baseball Bash and December is "The Marathon" as Ingram calls it. 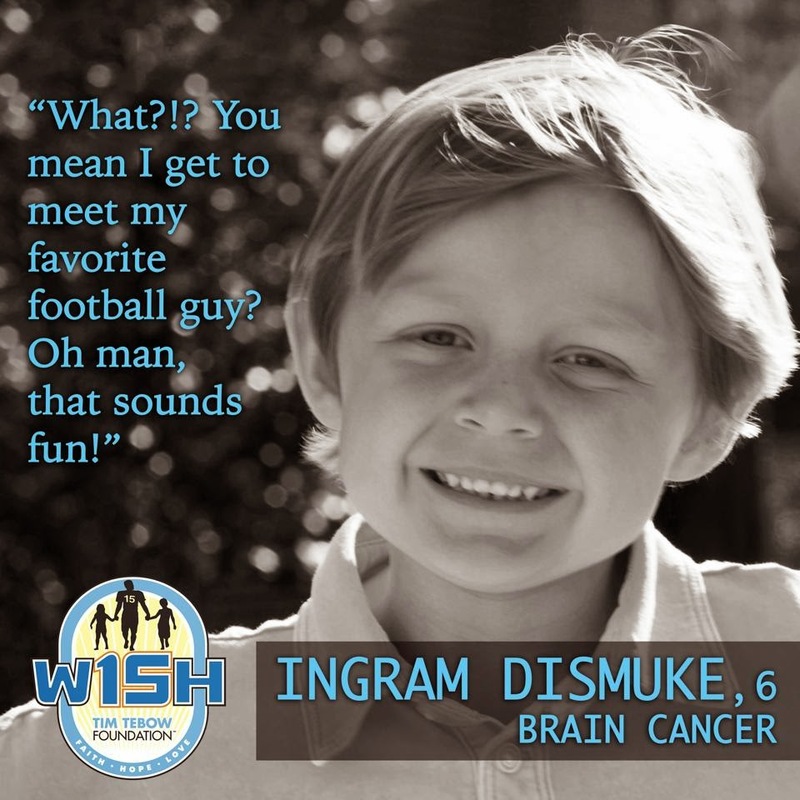 If you want to make a donation to St. Jude Children's Research Hospital in Ingram's honor for either of these events, we would love for you to make a donation through Lindsey's fundraising website. Her website is www.heroes.stjude.org/lindseydismuke or you could click on the link below if you want to make a donation! 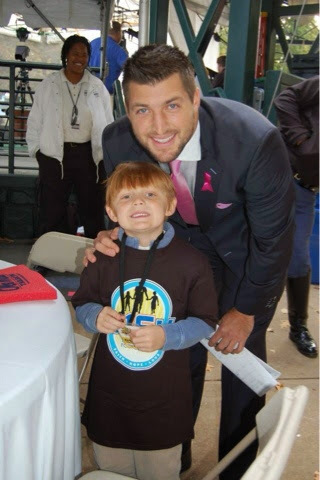 It's Tim Tebow Time!!! 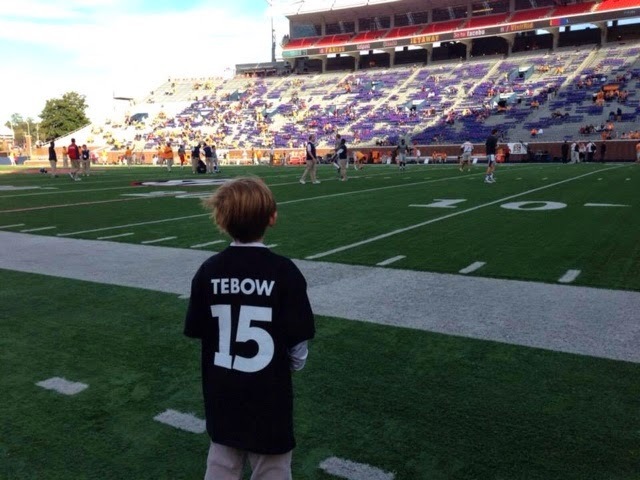 Like we said earlier, we got a phone call from the Tim Tebow Foundation with an offer Ingram couldn't resist! 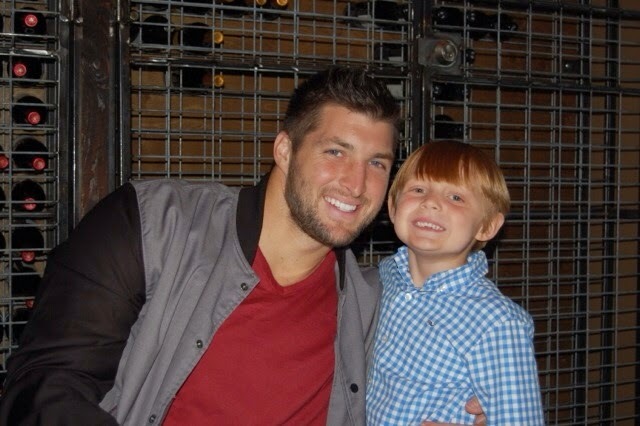 I do have to say Craig couldn't resist it either because of his well-known "man crush" on Tebow. They were both so excited and the girls were beyond jealous since they already had plans that couldn't be changed. So from Wednesday to Friday we were working like crazy to get paperwork done and everyone packed for their different directions. The chaos was well worth it and I only wish I could have been a fly on the wall to hear and see everything that happened! 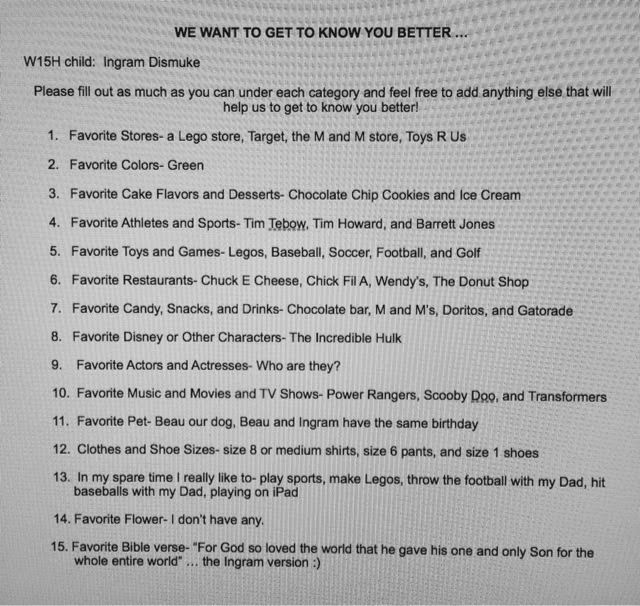 One Of The Forms We Filled Out Word For Word From Ingram With No Advice From Us! 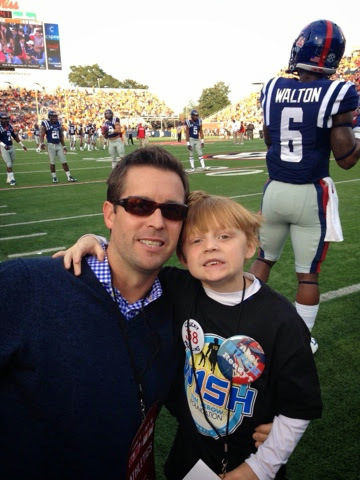 First up, Craig and Ingram rolled into Oxford, Mississippi just as everyone and their brother were also getting in town for the biggest SEC Game of the weekend!! 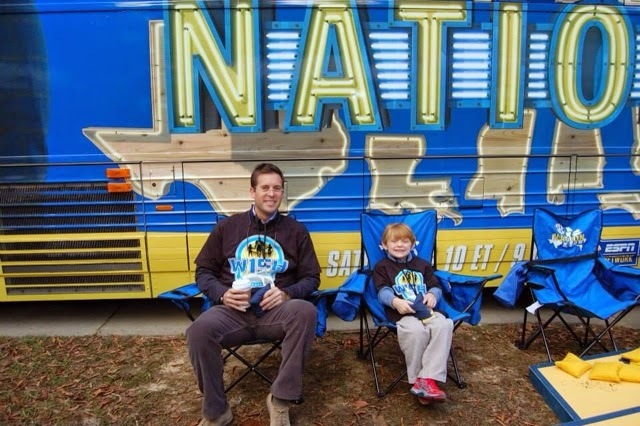 SEC Nation was in town too and starting to set up the TV set and The Grove was already getting pretty busy too. 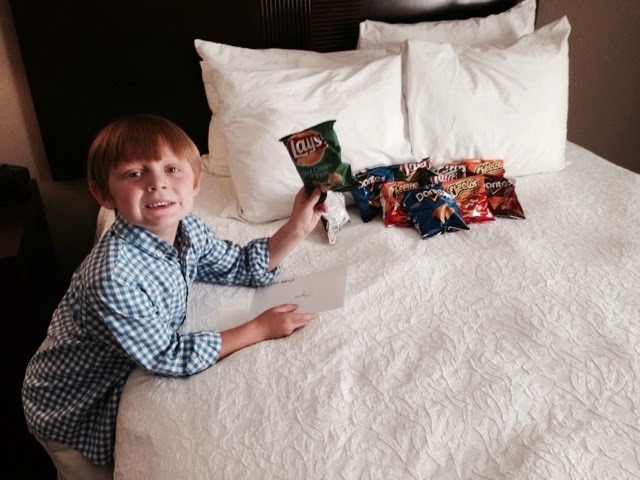 They made it to their hotel and when they opened the door to their room, they were surprised by balloons, cookies, chips, and Gatorade that were all Ingram's favorites. 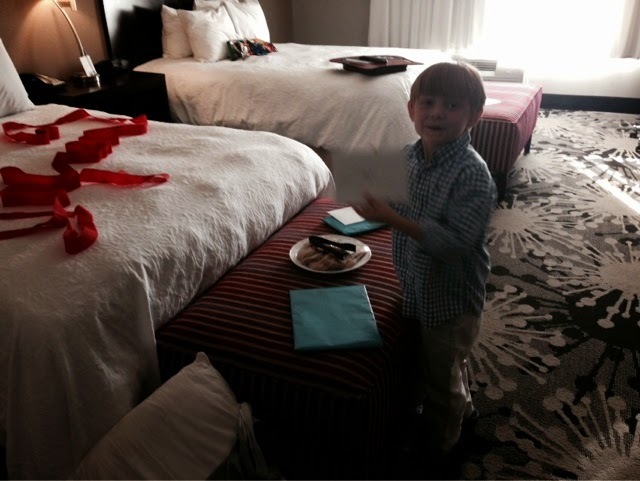 Brandi, the TTF coordinator, was already at the hotel and had dropped off a few goodies at the room. 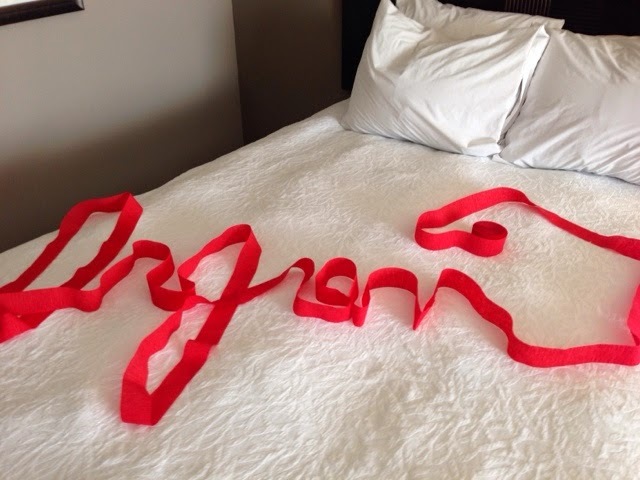 The hotel staff was even in on it and rolled out Ingram's name in streamers in the bed; there was also a small orange and blue football that went everywhere with Ingram. 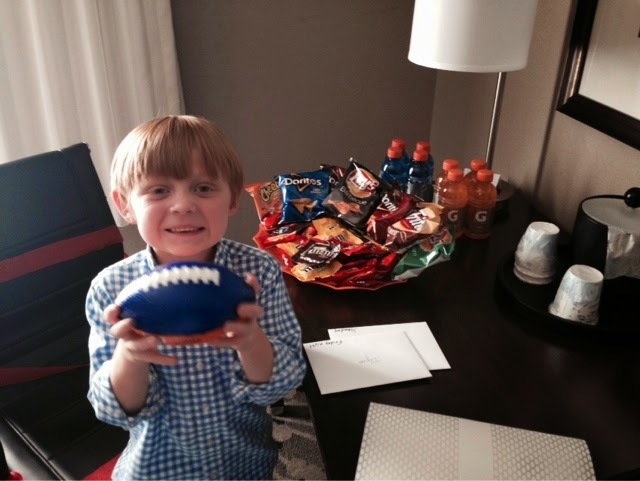 ...And More Chips And Gatorade And The Best Little Football Ever! 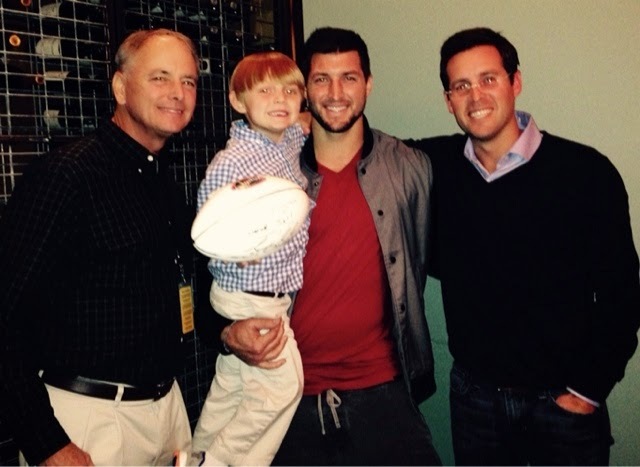 Next up, dinner with Tim Tebow and his Dad. I must admit this was the funniest part...waiting for Ingram and Craig to meet Tim. Once they were in the restaurant and waiting for Tim to come in, I got a text message from Craig that said "Seriously, I'm nervous." I knew right then (after I finished laughing) that they were about to have the best weekend ever!! Tim and his Dad came in and they spent the next THREE HOURS talking and playing and eating and playing and talking and playing even more! 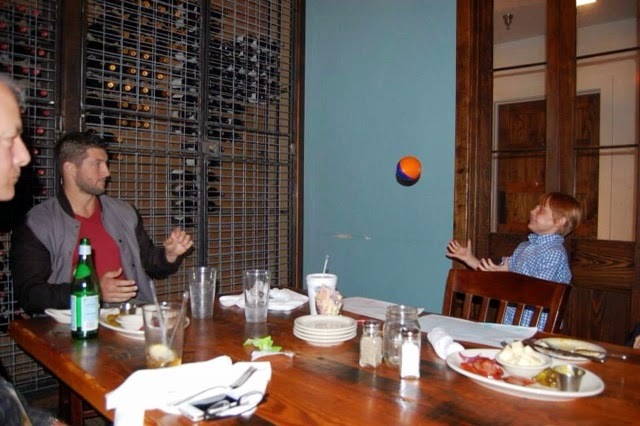 Ingram and Tim were running routes all around the table and having a blast; the funny thing is that Tim started within an arm's reach of Ingram waiting for him to snap back the ball and Ingram would send in a bullet right at his face. After a couple of those, better spacing was taken by everyone so that no injuries ended up happening! Back to the hotel they headed for a good night's sleep (once Ingram calmed down from all the excitement) so they would be bright-eyed and bushy-tailed for their next big event! What?? 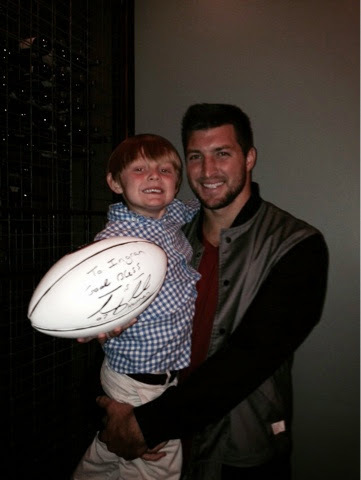 Wouldn't You Play Football At Dinner...With Tebow?? 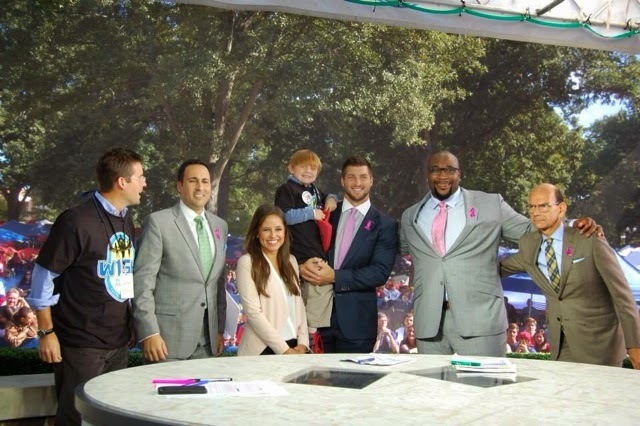 Saturday morning was a little cool when they walked through The Grove to see Tim Tebow again at the set of the SEC Nation! 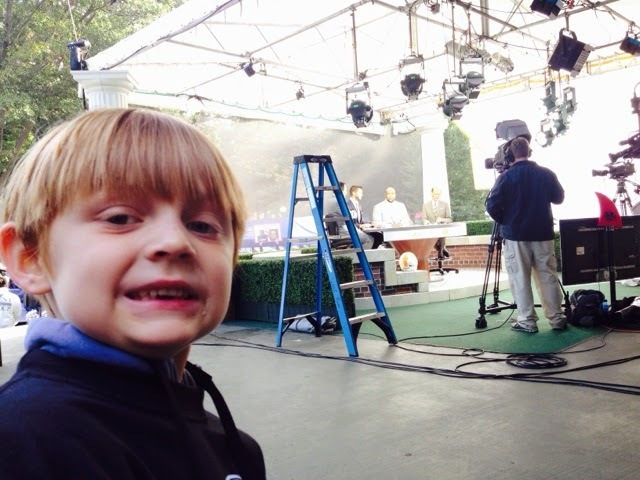 They had all-access passes to Tebow and the rest of the anchors and a tour of the set. 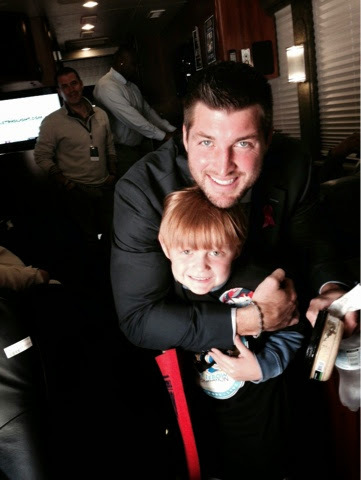 Ingram got to hang out with Tebow again and he even let Ingram go inside the SEC Nation bus, which Ingram thought was really cool! 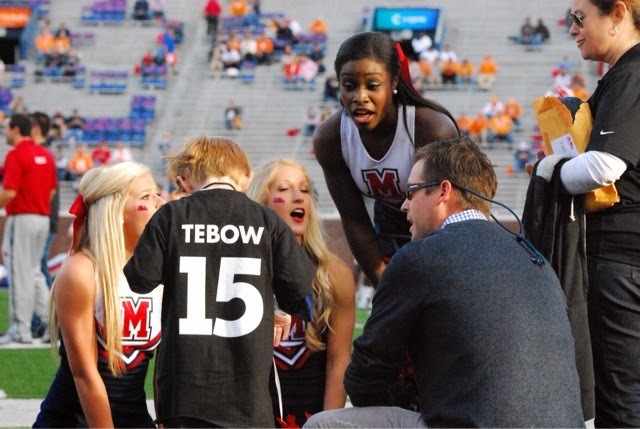 Aside from just hanging around before, during, and after the show, they met all sorts of fun people...including the Ole Miss Cheerleaders and Dancers! Oh my goodness how my boys have been spoiled...and it's not even over yet! Waiting For The Big Show To Start! Well...There Are Some Smiles And Not Some Smiles! I Have A Feeling Daddy Might Have Said Something At The Wrong Time! Better Stay On Tim's Good Side...Totally Kidding! 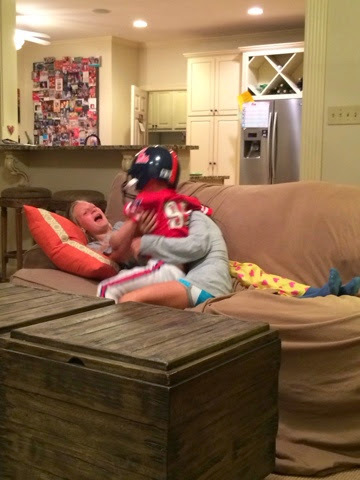 "Uh Dad...I Can't Get The Helmet Off!" Craig and Ingram piddled around Oxford before Ingram talked Craig into going swimming in an outdoor pool; and yes, the water felt like ice!! 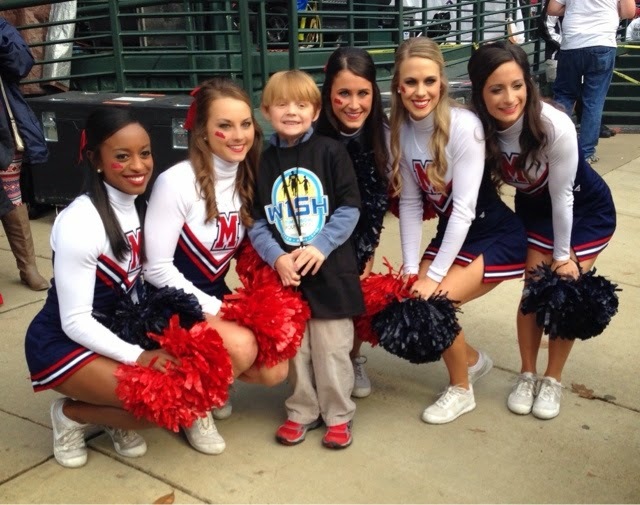 Thankfully it didn't last long and they headed to the room to warm up and take a little nap before heading back down to another special event...sideline passes to watch the Ole Miss Rebels warm up before the game and of course see the cheerleaders and dancers again! 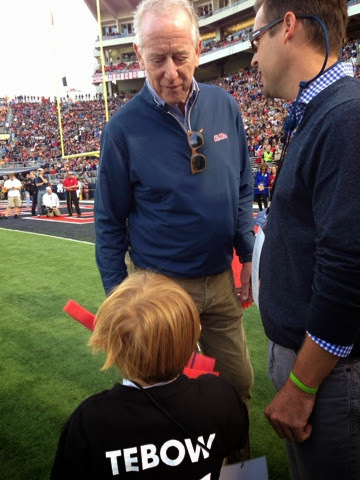 They also met Archie Manning and talked to him for a bit which was really cool for Craig, Ingram was more focused on his Shark at that moment. 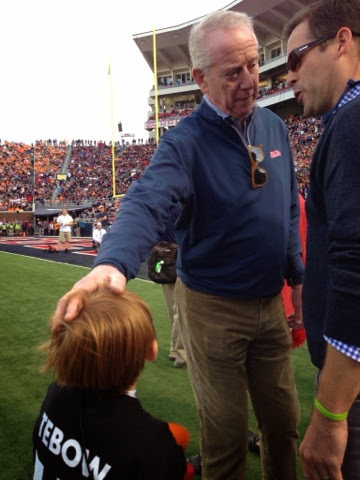 Craig and Ingram headed up to the stands to watch the game with Brandi and had a blast rooting THE WHOLE TIME for Ole Miss with his VERY LOUD VOICE! It was a whole new level of Ingram that came out during the game, but as usual, they made friends with everyone around them and it was the best game ever! Watch Out!! They're About To Be Let Loose! "This Is So So Cool!" The Perks Of The Sidelines...These Guys Are Huge! That Would Be A Little Bit Of Bed Head Ingram's Wearing! He Took A 2 Hour Nap After Swimming! 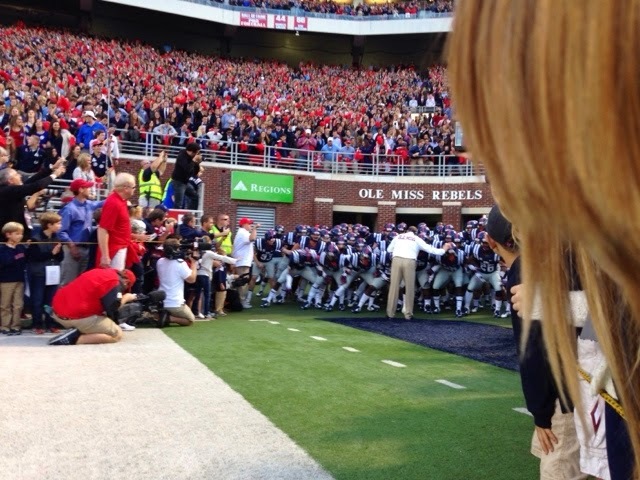 Ingram Getting High 5's in the Head from QB Bo Wallace! 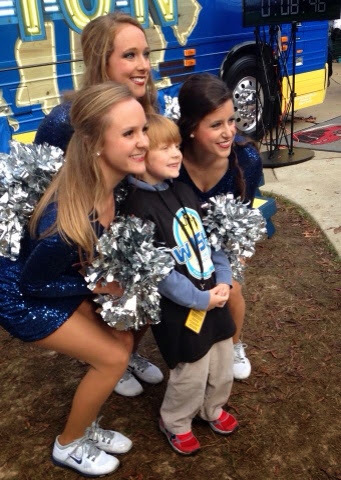 It's Official...He's Definitely A Ladies Man! 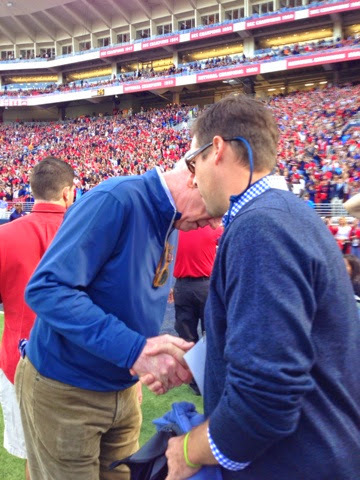 Craig And Ole Miss's Own Archie Manning! 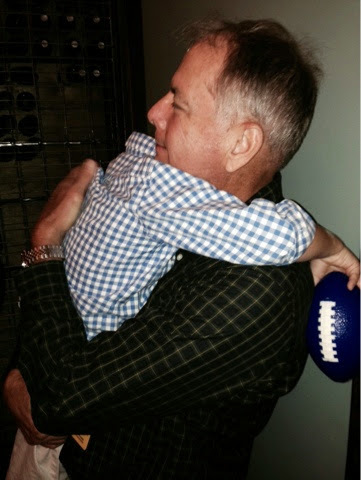 And Of Course, Ingram Needed To Show Mr. Manning His Shark! "Daddy, There's A Shark On Your Head!" 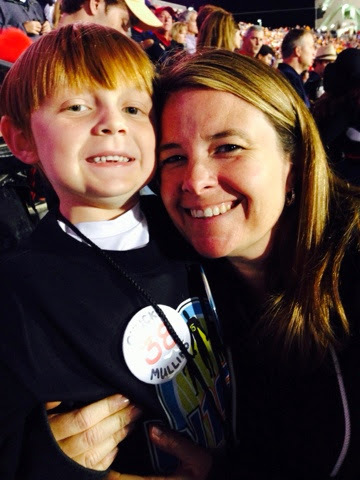 Ingram And Brandi, Our TTF Coordinator! When we all finally got home from our different trips, Ingram wanted to surprise the girls with his new stuff! All along he had been saying he wanted to be a pumpkin when he went trick or treating and he decided to make a switcharoo after his trip but he wouldn't tell the girls. 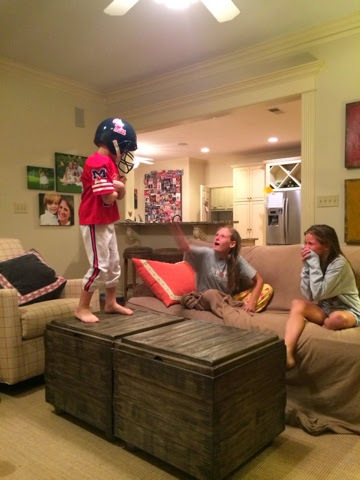 He made them sit on the couches while he and Daddy were in the bedroom getting dressed in his new Ole Miss Rebels uniform. He even picked out the number that he wanted Daddy to iron on for good...#95 and we have no idea where he came up with that number, he just picked it. 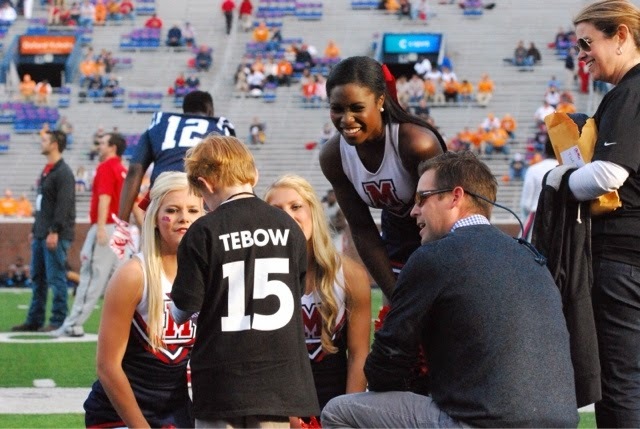 After his uniform debut, he and Daddy gave everyone their gifts form the Tim Tebow Foundation and from the Ole Miss Athletic Department. 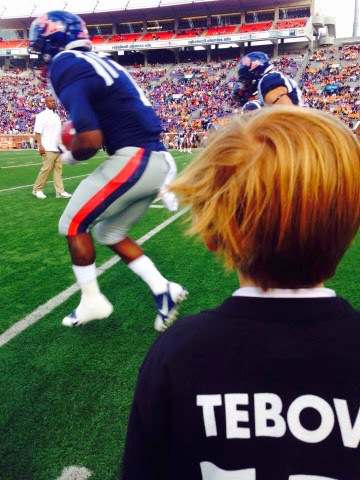 Ingram's favorites are his new Bible that Tim signed (he even wrote his own favorite verse in it...John 3:16), his signed football from Tim, and his Ole Miss Uniform. Oh what a weekend indeed! Ingram's Practicing His "Jump Down On You" Tackle! 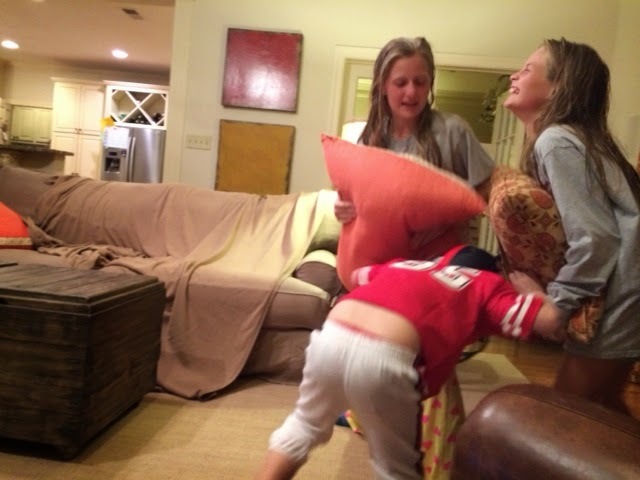 Well, Thank Goodness Those Were Pillows Because I Don't Think He Has The Right Tackle Form! Goodies From Ole Miss, SEC Nation, And The Tim Tebow Foundation! 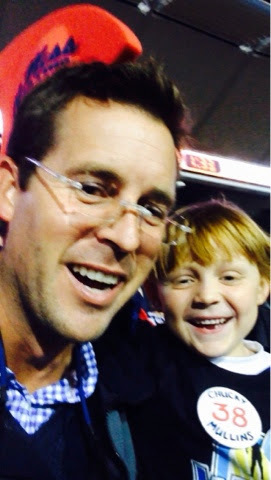 I know I don't need to say it because it's kinda obvious, but Craig and Ingram had a blast! 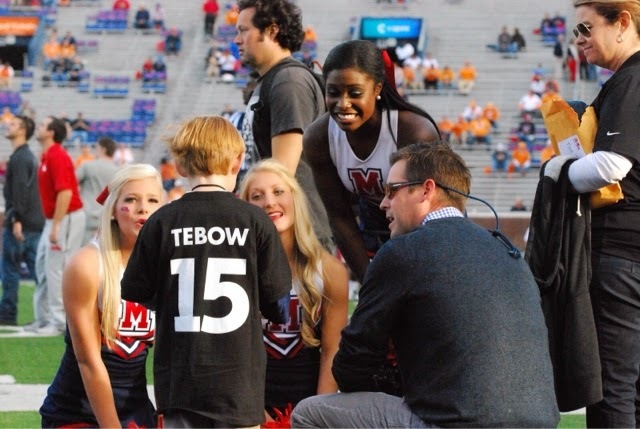 The Tim Tebow Foundation and Ole Miss made this weekend one that they will never forget. 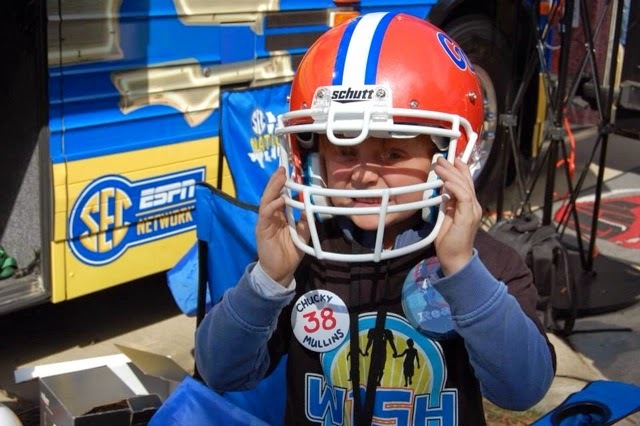 The Tim Tebow Foundation gave so much more than gifts to Ingram; they gave an experience that he will never forget! Brandi met them at the hotel and was in contact with me the whole time too sending me pictures of the different things they were doing. Both Tim and Bob gave Craig and Ingram their undivided attention at the restaurant even though there were tons of people trying to get in and speak to Tim because word had gotten out that he was there. The restaurant and hotel staff were amazing and did way more than just serving them food and cleaning their room. 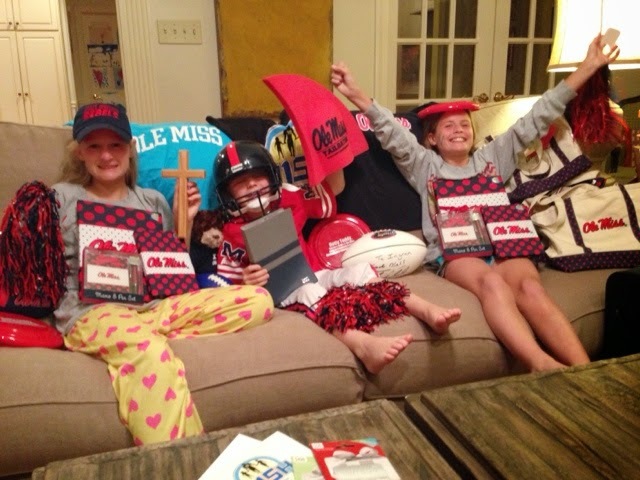 The Ole Miss University and Barnes and Noble Bookstore Staff gave so much of their own stuff once they heard what was going on that we are set to be Ole Miss fans for life...well, except when they play Florida! 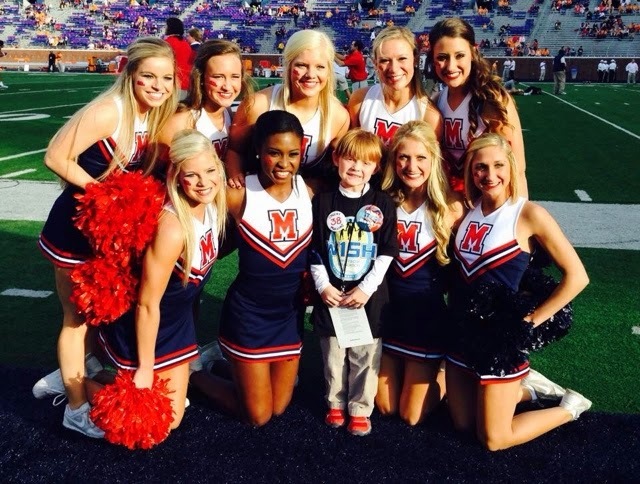 The Ole Miss Cheerleaders and Dancers took their time away from the regular crowds and spent time with Ingram and thought he was just the cutest little man around! 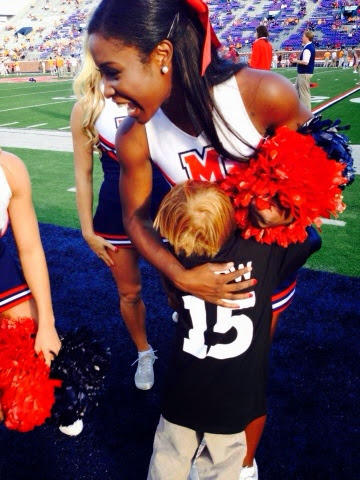 The whole Ole Miss Athletic Department and Football Team made Ingram feel so special by letting him down on the field during warm-ups that now I'm going to have more trouble keeping him off the football field as he gets older! Thank you all for making a great memory for our guys!